← Protest in the Trump era, part 2 of …..
Bizarrely, once he had assumed office, Donald Trump used his new platform to fight about reports of attendance and viewership at his inauguration. In real life, even much lower attendance would have little immediate effect on the fact that Trump is now president of the United States, and Republicans control both houses of Congress. It’s odd that he would want to fight on the obviously less favorable grounds of turnout and public support. 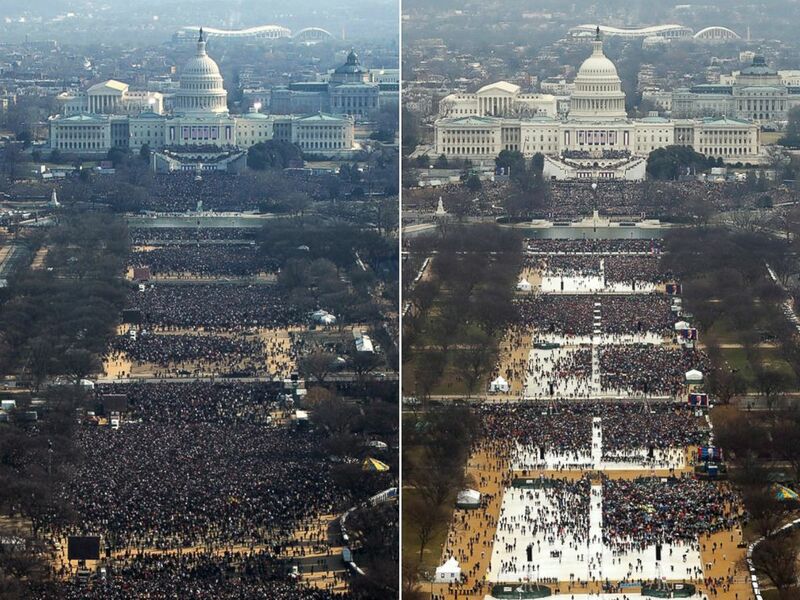 Inauguration attendance: Obama (2009) left; Trump (2017) right. But numbers matters more for protest demonstrators. The Women’s March turned out more than a half-million people in Washington, DC, and more than another 2 million in sister demonstrations across the country. They want to show their opponents that they are strong and powerful–and not going to go away. They want to show their allies in government that there are enough of them to deliver the rewards politicians care about–votes and campaign support, for example. They want to show potential supporters that they are worthy: perhaps that they are regular folk just like those watching; perhaps that they are particularly well-informed. In general, the more dramatic and disruptive the action, the fewer people you need to make an impact. But the large demonstration on the mall in Washington, DC is such a staple of American politics that large numbers matter…. But how do you know? Activists routinely inflate their best estimates of crowd size. Sometimes, it’s wishful thinking; often, they anticipate that police or media will deliberately low ball the count. Certainly you can’t take their word on it. The most earnest and intrepid reporter on the ground is poorly positioned to count into four or more digits (not a skill routinely developed in journalism school). Crowd experts get photos from above and count. They cut the field into grids, count some of them, multiply, and offer something of a fact-based estimate…. The National Parks Service used to provide the estimate mainstream media quoted, but stopped doing so in 1996 in the controversy about the (maybe not exactly) Million Man March the previous year. Now, mainstream sources generally report broad ranges (even of hundreds of thousands) or competing claims. And readers and viewers seem to accept the estimates of the people they like. To find serious attempts to count the participants at the Women’s Marches, take a look at Nate Silver (538.com), who focuses on the big cities, and a much more comprehensive effort coordinated by political scientists Erica Chenoweth (University of Denver) and Jeremy Pressman (University of Connecticut). The academics have staged a crowd sourcing operation that features reports of ranges from much smaller demonstrations at much less visible places. For example, the 18-22 people who showed up to demonstrate at Beaver Island, Michigan, were unlikely to be reported by any wire services. You can access their spreadsheet in progress. At this moment, it shows an estimated total of 3.3 to 4.6 million demonstrators across the United States, and another quarter-million people internationally. Unlike the Trump administration, the academics cite, and link to, their sources. In Washington alone, the Women’s March turned out at least a little more than twice reasonable (non-Trump) estimates of attendance at the inauguration (460,000-1,000,000 protested, according to Chenoweth and Pressman). Activists can take some pride in their efforts, but most went home, while Trump and his people are moving into power. Arguing about easily verifiable facts is hardly going to help the new administration build support or do its work. This entry was posted in Uncategorized and tagged Donald Trump, Erica Chenoweth. Nate Silver, inauguration, Jeremy Pressman, March on Washington, Metro, numbers, ratings, Washington DC, women's march. Bookmark the permalink.